Greyhound was the King of the Trotters. And Rosalind was the Queen. In 1939, they appeared together, poised to overturn a world record…..
Greyhound is to harness racing what Man O’ War is to thoroughbred racing. He is, quite simply, the stuff of legend. His record of 1:55:1 for the mile in 1938 stood until 1969, when it was broken by Nevele Pride. Of course, records are made to be broken. And Greyhound — the first “Grey Ghost” of horse racing — had more records than most, including a record he broke trotting a mile under saddle. 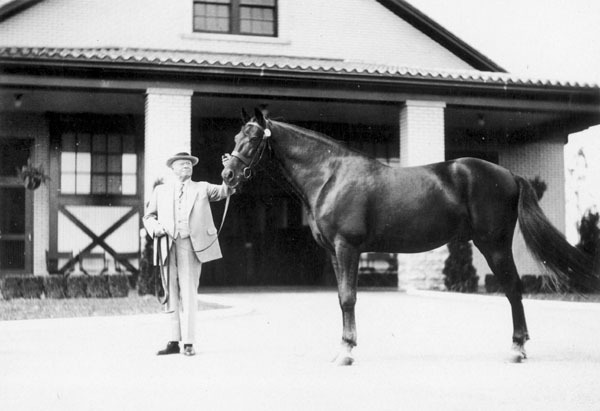 GREYHOUND’S sire, GUY ABBEY (2:06 3/4), pictured at Calumet Farm after the dispersal of Henry Knight’s Almahurst bloodstock. The colt foal was bred at Henry Knight’s famous Almahurst Farm and came into the world in 1932. At the time, his sire, Guy Abbey, had not attained leading stallion status and his dam, Elizabeth, had no exceptional progeny to her credit. The little fellow was grey — a colour no thoroughbred or standardbred breeder was happy to see. A superstitious discomfort with grey horses of almost any breed was alive and well in the 1930’s. And there was an irony to that, as concerned the standardbred. 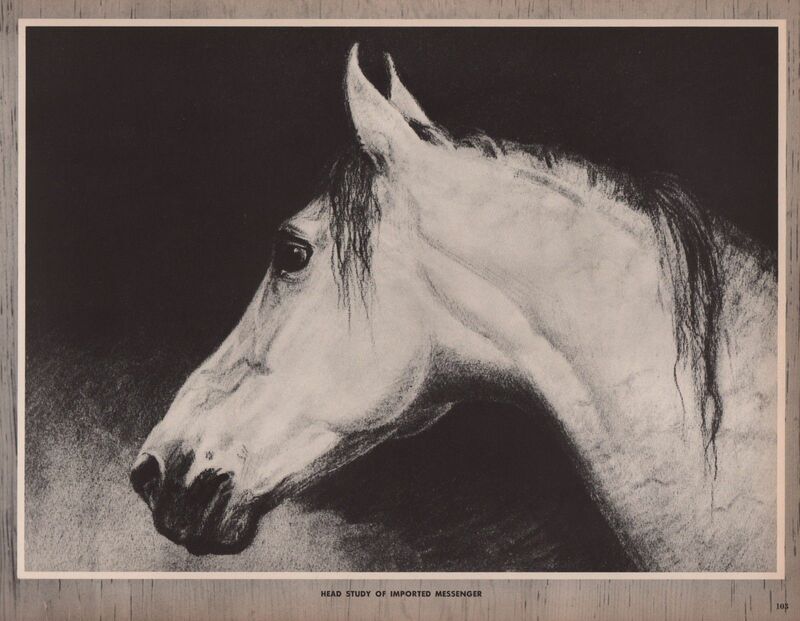 The “founding father” of the standardbred horse was Messenger (1780), a grey thoroughbred imported into the USA just after the American Revolution. The standardbred was developed in America, as was the American Saddlebred and the Tennessee Walking Horse — and all these breeds trace back to Messenger, who was their foundation sire. Messenger may have been grey ( and was probably exported because of it) but he stands as the most important sire ever to arrive on America’s shores. By the time he appeared as a yearling at auction, Greyhound had been gelded and given his name. He sold for $900 USD to Colonel E.J. Baker of St. Charles, Illinois. Greyhound’s sale price appears to indicate that breeder Knight hadn’t tagged him as brimming with potential. But fate can be cruel: Knight parted with the crowning achievement of his breeding career for a ridiculously low price, even by Depression standards. 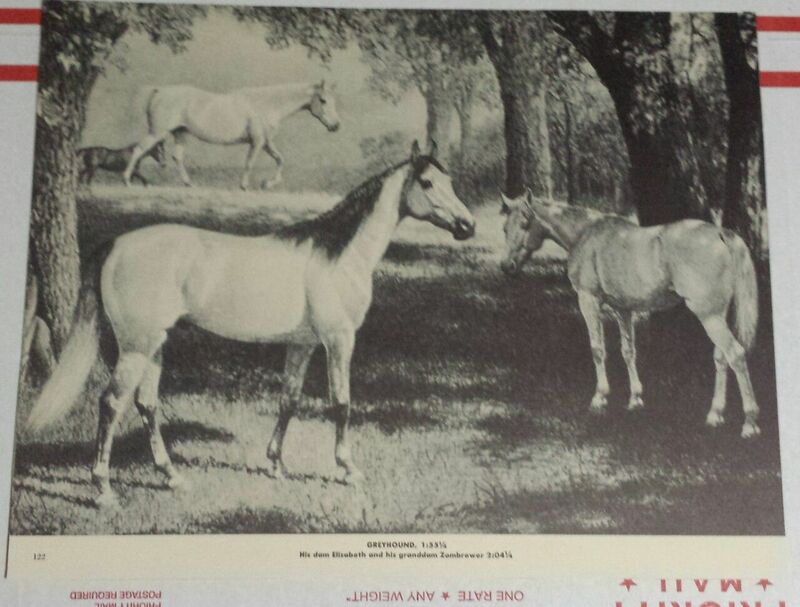 At the time, a pair of Hackney ponies would have cost more than did the gunmetal grey son of Guy Abbey and Elizabeth. But if Fate had dealt Henry Knight a cruel blow, it took the opposite aspect for Greyhound. He was about to join a powerful triumvirate of men who would appreciate him every step of the way. As the young colt was being readied for his 2 year-old campaign by trainer-driver Sep Palin and handler, Jimmy Wingfield, a royally-bred bay filly had made her way into the world. ROSALIND, shown here with her dam, became the subject of one of Marguerite Henry’s most beautiful books, BORN TO TROT. The filly was named Rosalind and given to her owner’s critically-ill son, Gibson White, by his soft-spoken, brilliant father, Ben. Ben had tuberculosis and was in isolation in a hospital for patients with the “White Plague.” The disease was still a threat worldwide and Gibson aka “Gib” was in grave danger. Ben White determined to rally his son’s mind and spirit by giving him the filly and the job of overseeing her from weaning to the track. Right from the start, Rosalind was a father-son affair, since it was Ben who would train her. Below is a short video of a hospital for tuberculosis patients in the UK in the 1930’s. “World champions and exceptional colts developed by Ben White, if expounded upon at any length could easily fill a volume, and such a book would be a harness horse’s counterpart of a Who’s Who. If their effects and impact upon modern day breeding and pedigrees of present day horses were considered, it would again fill another book. 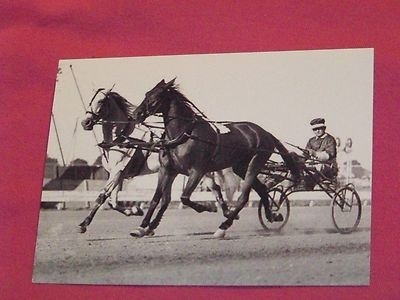 Starting with the world champion trotting stallion, Lee Axworthy, and the world champion filly, Volga, which came under his wing when he started training the Pastime string, the parade of champions which bore the stamp of Ben White’s training ability was a long one. Some of the better known ones include: Rosalind, Alma Lee, Lee Axworthy, Jane Revere, Volga E. (Volga), The Abbe, Mrs. McElwyn, Aileen Guy, Sumatra, Ruth M. Chenault, Main McElwyn, Isola’s Worthy, Mary Reynolds, Kashmir, Media, Twilight Song, Long Key, His Excellency, The Ambassador, Charm, Station Belle, and Deana.” (from The Daily Reporter, September 5, 1958) Add to this list White’s fourth Hambletonian winner, Volo Song. A gorgeous photo from 1933 of BEN WHITE and the trotter SPENCER McELWYN. ROSALIND’S sire, SCOTLAND (1:59 1/4), at 2 years with BEN WHITE. The royally-bred Rosalind was a daughter of Scotland out of the champion mare, Alma Lee (2:04 3/4). As Ben began training the filly, he was conscious that he was really training a member of his own family. Ben had bred her and trained (as well as driven) her parents, her grandam (Jane Revere) and her great grandam (Volga E.). It had been thirty years from Volga E. to Rosalind — more than a third of Ben’s adult life — to arrive at the moment when Rosalind first stepped onto the track. As years pulsed through the reins, memories took Ben back — and hope took him forward. GREYHOUND and SEP PALIN on the track at Goshen, NY, where the Hambletonian is run. Greyhound was a big, gangling colt at three. He stood 16.2 h and because of his size, usually got off to a slow start. Whereas the colt had been a bit ditzy at two, by his three year-old campaign Greyhound had figured it all out. Sep Palin seldom even raised his whip. All he had to do was send the message that it was time to move and off went the “Grey Ghost” with a surge of power and a beauty that was as spell-binding as it was devastating. 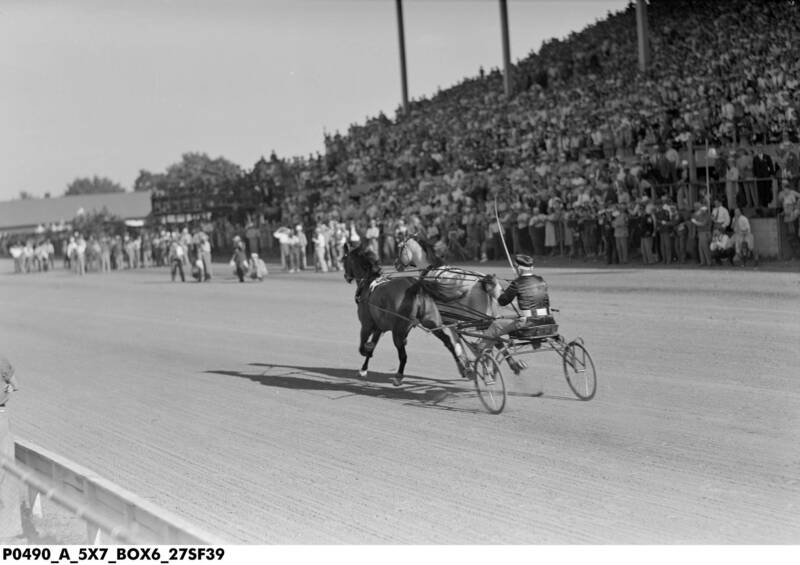 Although Greyhound didn’t start as the favourite on Hambletonian day, before a crowd of some 40,000 the colt trotted the first mile heat in 2:02¼, setting a new record in the last half. Greyhound then ran the second heat in 2:02¾. 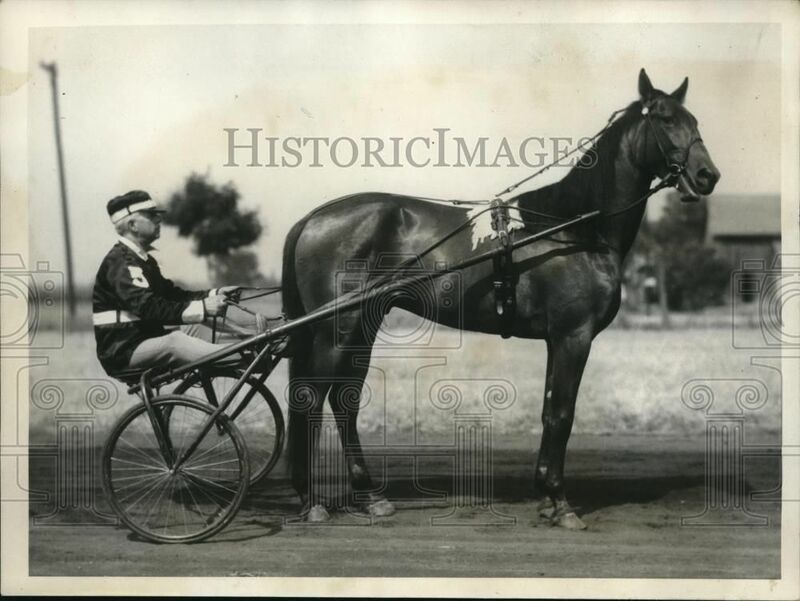 Taken together, his time over the first two heats made the 1935 Hambletonian the fastest ever run. Greyhound was also the first gelding to win it — and the only grey. The sheer beauty and power of GREYHOUND made him unforgettable. GREYHOUND gets a kiss from SEP PALIN following their Hambletonian win. 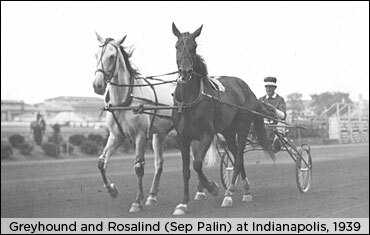 As Greyhound was busy etching his name into the pantheon of the (harness) racing gods, Rosalind and Ben White stepped onto the track for the first time. Whether it was the love she had known or the royal bloodlines she carried or both, the stately filly proved herself brilliant. Rosalind started ten times that year, winning six. And she took two-year-old champion decisively, with a brilliant win in the Junior Kentucky Futurity in a time of 2:03. 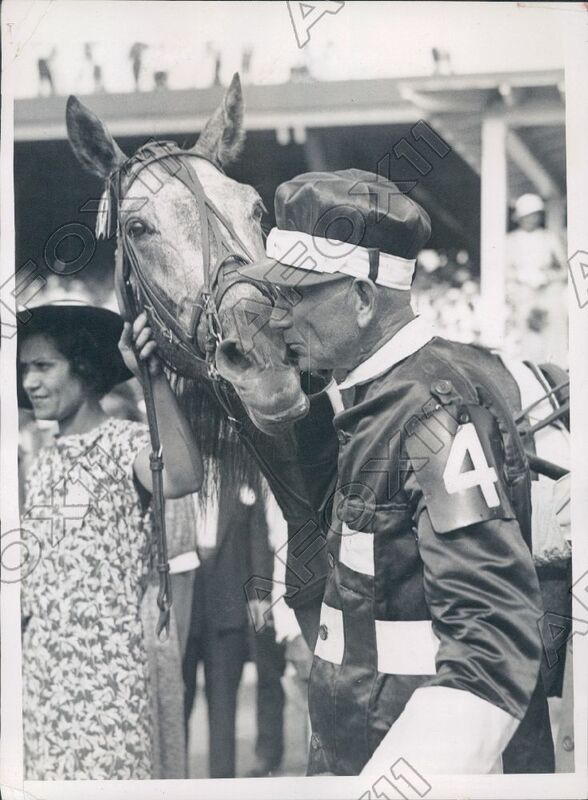 As if all this was not enough — standardbreds being as numerous as thoroughbreds at the time, making the chances of coming across one so brilliant rare — Gib’s recovery was as sure, as emphatic, as his wonderful filly’s victories on the track. Held held high, Rosalind ambled to the start as Gib and a packed grandstand held their breath. 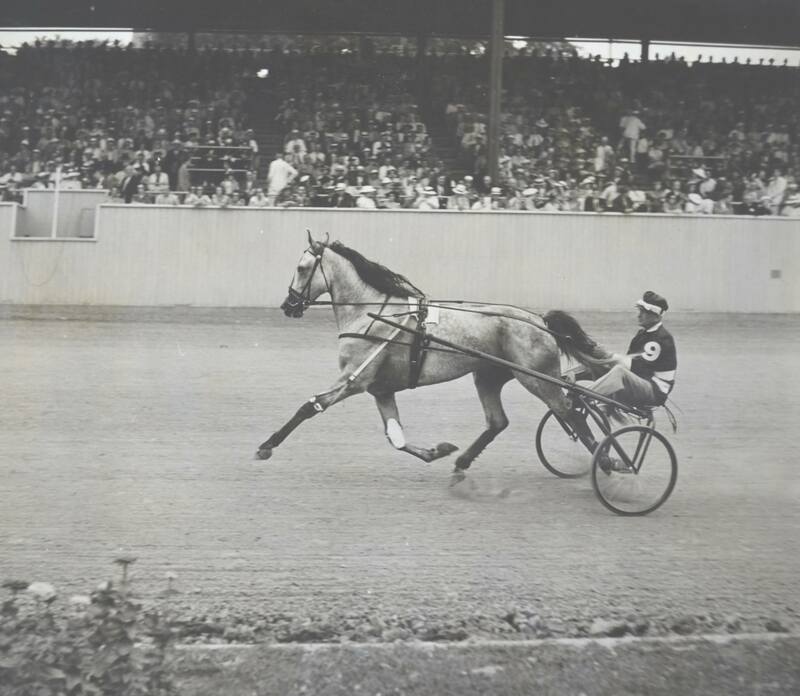 ROSALIND wins the 1936 Hambletonian, BEN WHITE at the reins. In the photo, you can see the reaction of the more than 25,000 as the Whites’ champion filly nears the wire. For GIB WHITE, who was also there, the joy was indescribable. ROSALIND with owner, GIBSON WHITE. There seemed to be no question that Gib’s love for his filly was central to his recovery from tuberculosis, a life-threatening disease. Greyhound and Rosalind continued to ratchet up victory after victory. 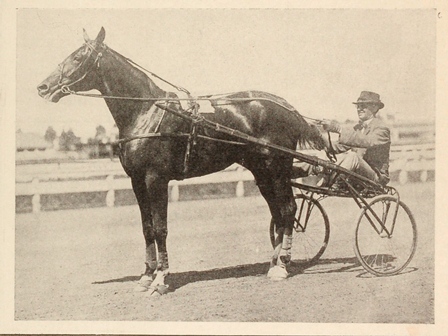 It was evident to all that there was another throne in the court of harness racing and it belonged to Queen Rosalind. The filly’s career best of 1:56 3/4 was only a hare short of Greyhound’s 1:55:1 for the mile — unheard of at a time when fillies under harness typically posted career bests of two minutes. The “gift filly” — ROSALIND and BEN WHITE. In 1939, at the Indianapolis State Fair, the two were harnessed in tandem to try to lower the existing team record — their own. Earlier, the pair had trotted to a time of 1:59 in Syracuse, NY. 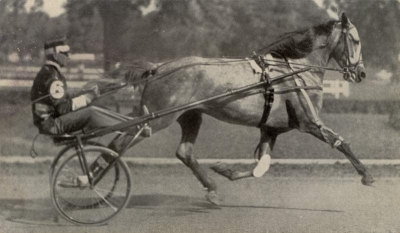 Before Syracuse, neither Greyhound nor Rosalind had ever been driven in tandem before, making it doubly complex to handle them under the pressure of breaking the existing record, held by the great Uhlan and Leurs Forrest, who had trotted a mile in 2:03 1/4 in 1912. Neither the White nor the Baker camps doubted that they could do it. The question was: By how much? The other matter was to decide who would drive them; in the end, it was Sep Palin. Why Palin and not White is unclear, although it must be said that both teams were comfortable with the decision and accolades came their way for the classy manner in which this aspect was handled. The King and Queen of harness racing. 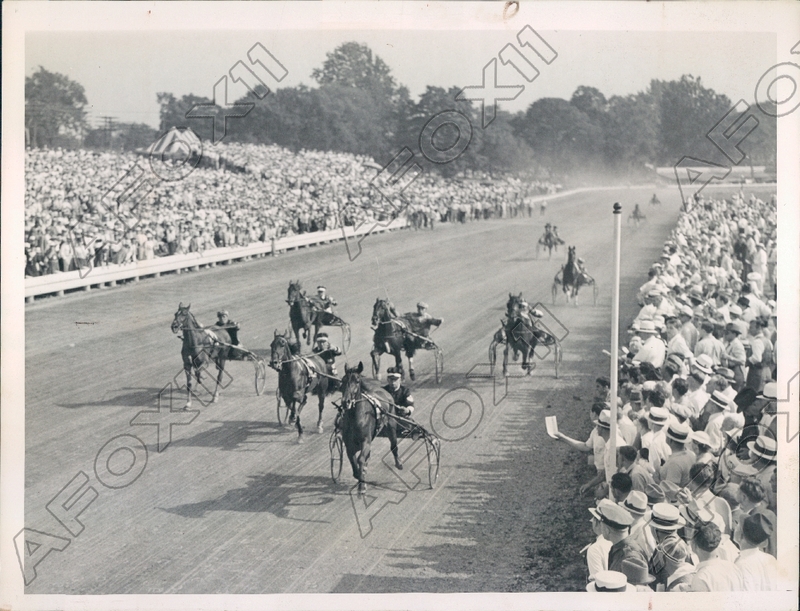 Spectators throng the stands and photographers line the track as ROSALIND and GREYHOUND trot to a world record at the 1939 Indianapolis State Fair. Photo and copyright, Indiana Library. At Indianapolis, Rosalind and Greyhound were looking to take down their Syracuse record — they were racing against themselves. But those who saw the King and Queen that day were deeply moved. Horseman generally are a crusty bunch, but even they were enchanted by the appearance of the Grey Ghost in harness with the best standardbred mare in the world. They were almost the same height, one blood-bay and one almost white, and they moved together seamlessly, passed the crowded stands, down to the start. It was August and the light was heavily flecked with gold. Their was restrained quiet as the “exhibition” began; two champions, matching one another stride for stride, floated passed the crowd for the first time. It was equine ballet on fast-forward, but so easy did the pair make it look that only the man holding the stopwatch really knew how fast they were moving. Racing against the wind, Rosalind and her handsome King trotted the mile in 1:58 1/4. As Sep Palin pulled them up and turned them back towards the jubilant throng, Rosalind nodded her head before reaching over to gently nibble Greyhound’s neck. Gib White, watching with his dad, took the footage below. Poor as it is — through no fault of Gib’s — it records an epic moment in the annals of harness racing history. Rosalind and Greyhound certainly weren’t “things,” either to those who knew them best or those who grew to love them. But on that day in 1939 when the narratives of the grey, gelded colt who rose to become an icon and the blood bay filly whose brilliance on the track was only exceeded by her capacity to heal interwove, hearts cracked wide open to a beauty larger than many had ever known before. Greyhound’s complete career record is catalogued below, in the Bonus Feature. Greyhound and Rosalind led happy lives in retirement. However, Rosalind died suddenly at the age of seventeen and an autopsy showed that she had succumbed to cancer. She left her human family too suddenly, even though she had given Ben and Gib White six foals, all fillies, three of which set champion times as three-year-olds. 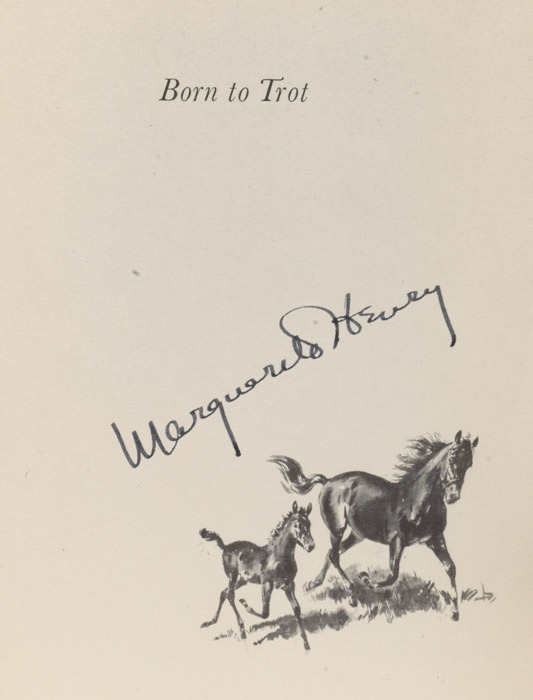 Although film footage of both Greyhound and Rosalind is scarce, the White’s super filly is commemorated in Marguerite Henry’s terrific book, Born To Trot. 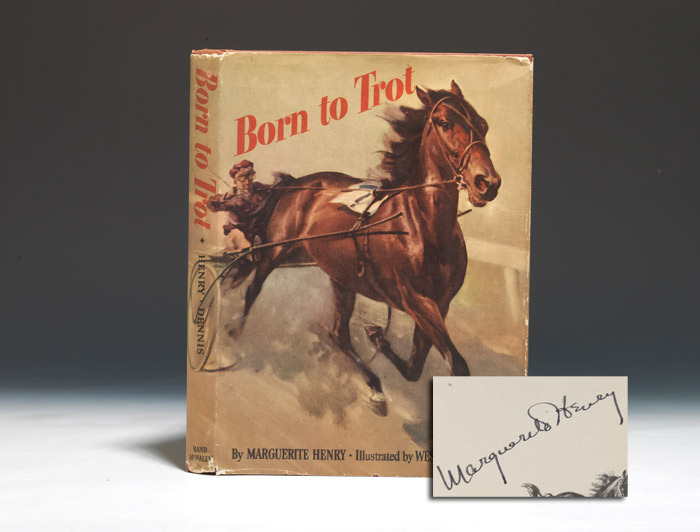 Although she takes some “artistic license” in the telling, Marguerite Henry’s BORN TO TROT is ROSALIND and the White family’s story, told with much love and drama. 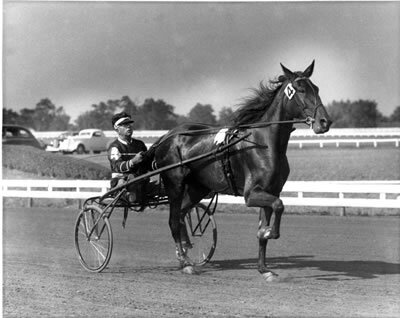 Ben White went on to win the Hambletonian another two times, in 1942 and 1943, with The Ambassador and Volo Song, respectively. Gibson White made a complete recovery and became his dad’s assistant trainer. 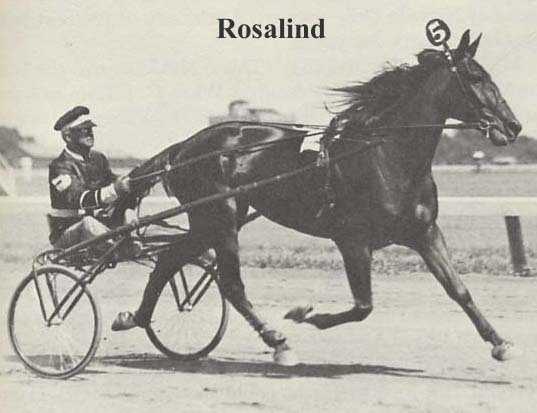 Both Greyhound and Rosalind were inducted into the Harness Racing Hall of Fame (in 1958 and 1973, respectively). 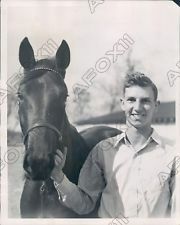 Ben White was inducted into the Harness Racing Hall of Fame in 1958 and the Canadian Horse Racing Hall of Fame in 1977.